When it comes to the global economy, I don’t have the foggiest clue what I’m talking about. I watch the people who do know — economists, pundits, newscasters — and when they get happy, I get happy. If they get nervous, I get nervous, even though I may not know why. I only know a little more than nothing about personal economy. I snip coupons, look for restaurant specials (happy hour ones in particular), sign up for apps that give me discounts and join email lists to be notified of deals on my favorite web sites. Everyone loves a deal. Many people need a deal. In the not-so-distant past, the people of India were searching for deals on SMS messaging. Because of the economic situation at the time, SMS was becoming cost-prohibitive. The answer to their problem was OTT apps. WhatsApp, for example, gave them the ability to text other in-network users worldwide for free. But WhatsApp doesn’t have a calling feature. Currently there are 102,673 college students from India in the United States, making up 11.6% of the total U.S. student population. As everybody knows, students need to be able to call and ask their parents for money! So how can they phone home for next to nothing? The answer: Voxox. When you use Voxox, in-network calls are free and unlimited. That means you can call any Voxox user anywhere in the world for free. 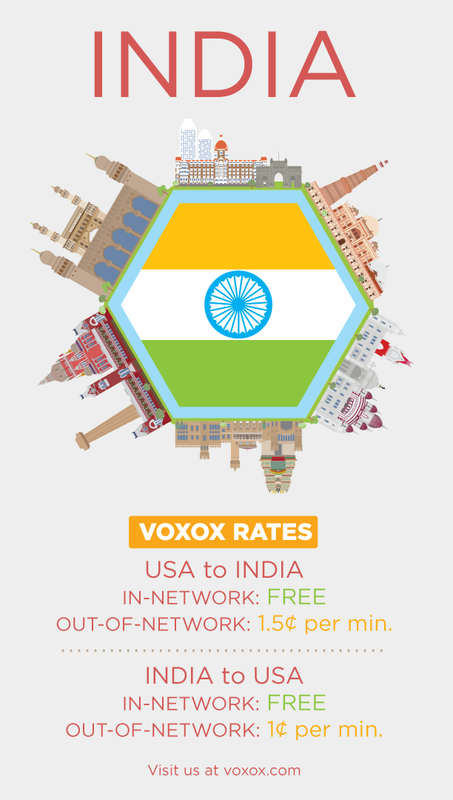 Voxox out-of-network calls to India are just 1.5 cents per minute. Rates even a college student can afford. But the news gets even better! Calls from India to the U.S. are only one cent per minute! This is because Voxox users — regardless of country — receive a free U.S. number, effectively making their call from India (or any country) a call from within the United States. And once they see how great Voxox’s calling rates are, they won’t want to switch to another app just for texting. So with Voxox, the college parents can call their children from anywhere in the world and tell them to phone home more often for practically nothing! By the way, for all you gamophobes (myself included), Voxox requires no commitments and no connection costs. Want more? Okay, how about this: Voxox “tops off” your free account with $1 each month just because they love you. * So even if your parents in India stubbornly refuse to sign up for Voxox, you can still make free international calls because a dollar goes a long way with Voxox’s super-low international rates. Now for the bad news. Your excuse for not calling your parents back in Mumbai just went out the window. Sign up for Voxox today. It’s free, it’s easy and it’s great for your personal economy. Read more about international calling in the blog post entitled Around the World With Voxox. Coupons, deals and sales come and go but free international calls are forever!